​Storage enclosures come in many varieties to target different market segments. They usually have one or more downstream SATA ports, while the uplink might be USB, eSATA, or Thunderbolt. USB is one of the most popular interfaces, and the rapid adoption of Type-C has only strengthened its presence in the low-end and mid-range markets. Within the USB storage enclosure market, device vendors have multiple opportunities to tune their product design for specific use-cases. 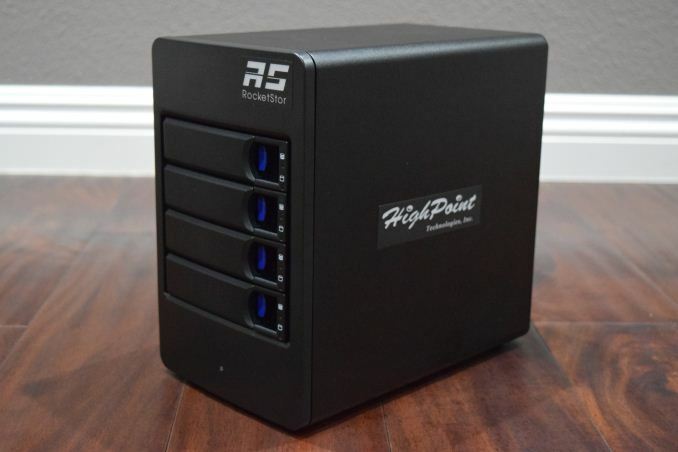 Today's review will take a look at HighPoint's RocketStor RS6114V, a 4-bay direct-attached storage enclosure backed up by their software RAID stack. The HighPoint RocketStor RS6114V is a prosumer RAID enclosure. Traditionally, multi-bay storage enclosures that advertise RAID capabilities use hardware RAID. However, the RS6114V is different. HighPoint's aim with the product is to present prosumers with an economical DAS option while also serving to introduce them to their versatile RAID stack. The RS6114V can accommodate either 2.5" or 3.5" drives, and connects to the computer using a USB 3.1 Gen 2 Type-C port. It has a 250W internal PSU. A Type-C to Type-A cable is bundled with the unit. Screws for installing both 2.5" and 3.5" drives are supplied. The price point of $300 is achieved by avoiding high-end RAID chips with USB 3.1 Gen 2 bridges. 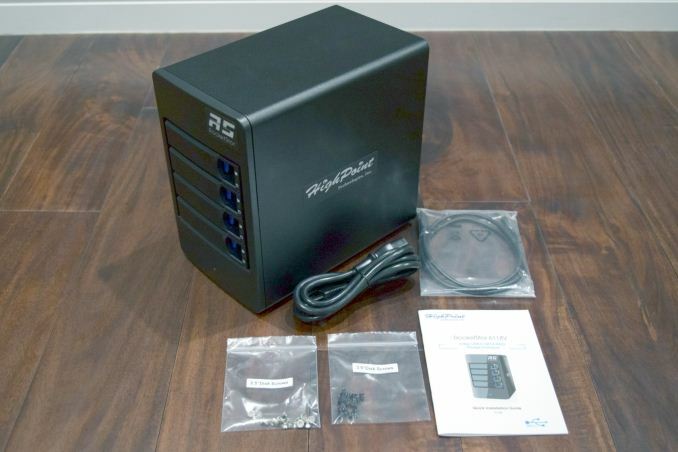 Instead, we have the ASMedia ASM1352R (seen in almost every 2-bay USB 3.1 Gen 2 DAS available in the market) coupled with two SATA port multipliers (1x to 2x) - the ASMedia ASM1092. There is a Xilinx CPLD on the daughterboard too (we are yet to figure out its purpose). The software RAID management is done via the HighPoint RocketStor RAID Manager software. As far as the RS6114V is concerned, the software is available only for Windows and Mac systems. The software is entirely managed via a browser UI. The configuration access can be secured with a password (off by default), and the port for the web server (7404 by default) can also be modified. The gallery below shows a quick overview of the UI and the options available. Aspects that differentiate the HighPoint RS6114V from the run-of-the-mill RAID enclosures and OS-provided software RAID include ability to set up emails for event notification, enabling auto rebuild (with continued rebuild even if an error is encountered), and the ability to set the priority for the rebuild process (important due to the software RAID nature of the enclosure). Setting up a RAID volume can be done using either the wizard (Quick Config.) or the manual way (Advanced Config.). The wizard allows configuration of JBOD, RAID 0, RAID 1, and RAID 5 volumes. The advanced configuration option can be used to create volumes in RAID 10 (in addition to the vanilla modes available through the wizard). Additional flexibility is also available - the existing data in the disks can be retained, or users can opt for a quick initialization. The initialization process can also be set for background or foreground operation. The cache policy (write back or write through) can also be configured. Since the enclosure uses software RAID, the appropriate policy must be chosen keeping in mind the probability of a power failure. The policy is set to write back by default. It can be changed even after the RAID array is created. The block size for the RAID can also be configured (512KB by default, configurable between 16KB and 1MB). The sector size can also be set to 512B (default), 1KB, 2KB, or 4KB. It is not necessary to use the full capacity of a selected disk for the volume, and certain disks can also be configured as hot spares. The software also allows for online RAID level migration or capacity expansion. The browser UI also includes an event view and a storage health inspector that presents S.M.A.R.T information of the installed disks in an easy to understand manner. In the rest of this review, we take a look at the performance of the enclosure, but, prior to that, we have the detailed specifications and miscellaneous aspects of the various storage bridges that we have evaluated so far. As is evident, the RocketStor RS6114V stands in a league of its own, despite the absence of hardware RAID.